The emergence of mosques across the country is sparking concern among the Irish public. 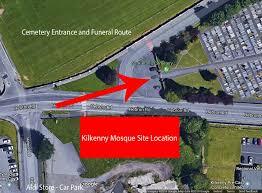 Kilkenny is the latest to be told of plans for the development of a Muslim place of worship. According to local reports the project is to be sited close to a consecrated burial ground in the city. John McGuinness’s brother Eugene is understood to have been strongly applauded after he stated that he had walked to every door in the area, “and 99.9 percent of people” did not want the building to go ahead. The Kilkenny People reports that “on a number of occasions people were asked not to record the contributions that were been made from the floor. People were also asked to refrain from using foul language as there were a number of children present. As well as a mosque, the €5 million development includes plans for a halal shop and cafe, community hall, library and accommodation. Meanwhile, the Western Islamic Cultural Centre has lodged an appeal with An Bord Pleanála, against the refusal, by Galway City Council, to grant retrospective planning permission for the use of a house at Mincloon, Rahoon, as a place of worship. The retention application to the Council had been opposed by a number of residents in the Rahoon area, on the grounds that there had been intensification of the use of the building, which was in a rural area without any public lighting or footpaths. The 2011 Irish census shows that there were 49,204 Muslims living in the Republic of Ireland in 2011, representing a 51% increase over the figures for the 2006 census. By the time of the 2016 census the number of Muslims had soared from 49,000 to 63,000, an increase of 29%. The closing date for objections to the planning application is April 19.